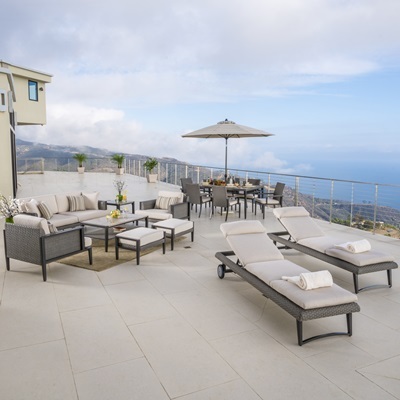 Create a beautiful outdoor living space with the complete 18pc Vistano Estate Dining Group. 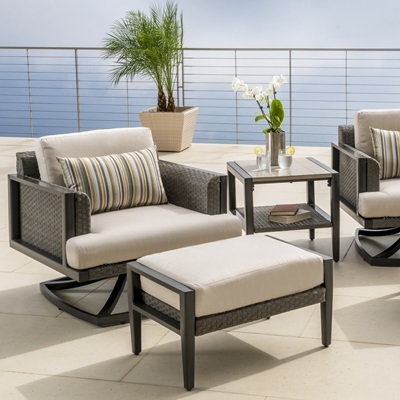 Entertain friends and family with everything you need to sit, lounge, and dine outdoors. Plush, deep seating is wrapped with Sunbrella® fabric and includes coordinating accent toss pillows. Kick back on the cushioned chaise lounges, chat amongst the 7-piece deep seating group, or enjoy the perfect outdoor meal on the faux wood top 9-piece dining table. Set includes a deep seating set with a 76-inch sofa, set of two motion club chairs, two club ottomans (which conveniently double as additional seating), set of chaise loungers with plush cushions, oversized coffee and side tables, and our 9pc dining group with a faux wood top table and six cushioned arm chairs. Ergonomically engineered to sit deep with ample back support. 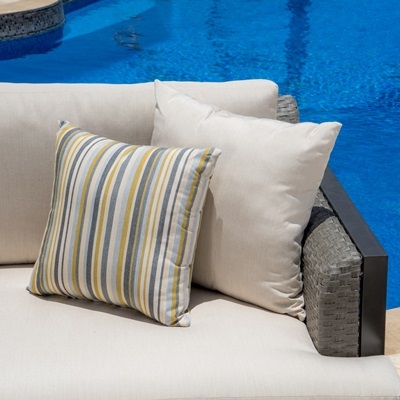 Plush 5-inch, high density, quick drying outdoor seating cushions are featured in a Canvas Flax Base with coordinated Catalina Tinsel accent toss pillows with contrast piping. The Vistano Collection uses Sunbrella® engineered fabric, which is constructed from acrylic thread and solution dyed materials are specifically designed for outdoor use. 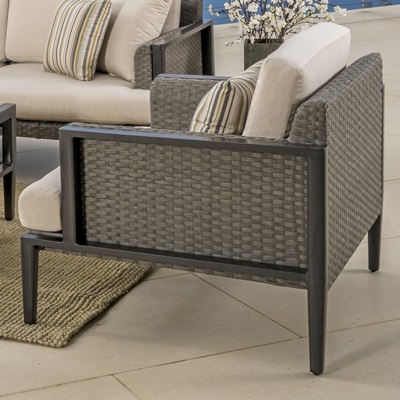 Hand-woven, commercial grade SolarFast® all-weather resin wicker with exposed dark charcoal powder coated aluminum frames specially engineered for rugged outdoor use.